The lobby features a beautiful and impressive stage, while all rooms have a view of the duck pond and a Japanese garden showing the beauty of the changing seasons. Cuisine made from fresh ingredients hand-selected by our head chef is heaped into elegant Arita-yaki plates, allowing enjoyment by both the eyes and the mouth. 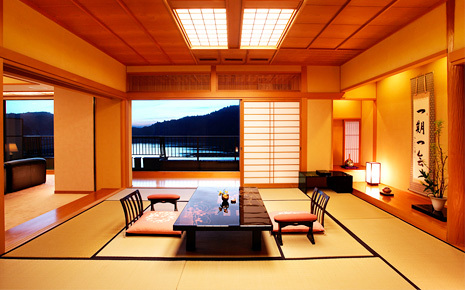 Relax among the ultimate luxury of Japanese aesthetics and remarkable hospitality. Filled with the luxury of Japanese aesthetics such as fine wood and marble stone, as well as comfort all around, the rooms present an ever-changing portrait of the seasons with a 180-degree view of the duck pond that is right out of a Japanese traditional painting. Enjoy a seemingly eternal moment away from the everyday, gazing at a land unmarked by residences. In 2009, our VIP suit “Azuma-en” hosted his majesty the Crown Prince. Beyond the steam of the hot springs stretches the duck pond. 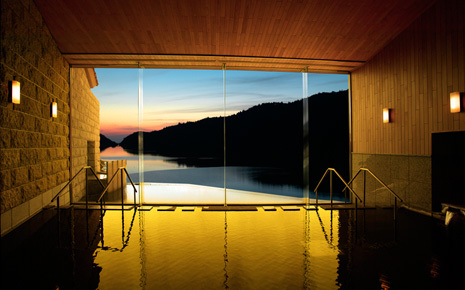 Gaze at the mountain scenery of Unzen while lounging in the hot waters, and the efficacy of the scenic beauty and natural springs will offer total relaxation. This is just one aspect of the hospitality of the Azuma-en. There is a large bath with wading pool, outdoor bath, and cypress wind bath with sauna. Of course, the water flows direct from our own spring. 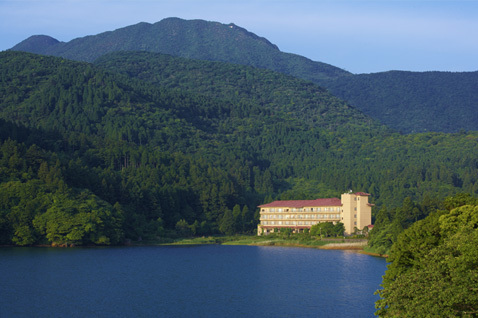 This is the only Unzen hot spring with 210.4 mg of the skin-beautifying metasilicic acid in its water. Guests will dine on the freshest selected local foods, served on Arita-yaki plates specially chosen by Azuma-en. First enjoy the seasonal bounty of Unzen with your eyes, then with your taste buds. 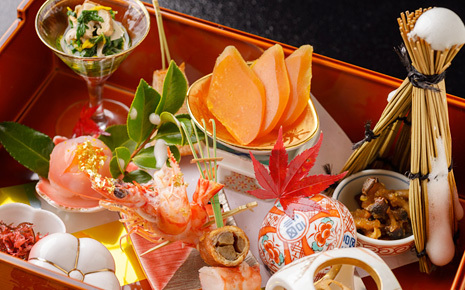 Our menu of not only Japanese cuisine but also unique western cuisine is guaranteed to please guests of all ages. Plans available such as day trip with lunch, day trip with dinner, 0 stays and 2 dinners.